Paul Rosenberg, Paris and New York (acquired from the artist, by 1926). Micheline Rosenberg and Paul Rosenberg, New York (gift from the above, by 1946); sale, Sotheby Parke Bernet & Co., London, 3 July 1979, lot 31. Viktor and Marianne Langen, Meerbusch (acquired from the above, 1980). W. George, L'amour de l'art, Paris, 1926, p. 189 (illustrated). C. Zervos, Picasso, oeuvres 1920-1926, Paris, 1926 (illustrated, pl. 23). J. Cassou, Picasso, New York, 1940 (illustrated, pl. 131). M. Gieure, Initiation à l'oeuvre de Picasso, Paris, 1951, no. 66 (illustrated; titled L'Epuisette). C. Zervos, Pablo Picasso, Paris, 1952, vol. 5, no. 459 (illustrated, pl. 184). W. Boeck and J. Sabartés, Picasso, New York, 1955, p.468, no. 117 (illustrated). F. Elgar and R. Maillard, Picasso, Paris, 1955, p. 129 (illustrated in color, p. 128). A.H. Barr, Jr., Picasso: Fifty Years of His Art, exh. cat., The Museum of Modern Art, New York, 1974, p. 136 (illustrated). P. O'Brian, Picasso: A Biography, New York, 1976, p. 273. V. and M. Langen, Kunst des 20ten Jahrhunderts: Sammlung Viktor u. Marianne Langen, Ascona, 1986, vol. I, p. 75 (illustrated in color, p. 76). G. Stavitsky, The A.E. Gallatin Collection: An Early Adventure in Modern Art, exh. cat., Philadephia Museum of Art, 1994, p. 12 (illustrated in situ in the 1927 opening installation of Gallatin's Gallery of Living Art). The Picasso Project, ed., Picasso's Paintings, Watercolors, Drawings and Sculpture: Toward Surrealism, 1925-1929, San Francisco, 1996, p. 33, no. 25-101 (illustrated). J. Palau i Fabre, Picasso: From the Ballets to Drama, 1917-1926, Cologne, 1999, pp. 452 and 522, no. 1604 (illustrated, p. 452). B. Léal, C. Piot and M.-L. Bernadac, The Ultimate Picasso, New York, 2000, pp. 229 and 231 (illustrated in color, p. 230, fig. 545). J. Richardson, A Life of Picasso: The Triumphant Years, 1917-1932, New York, 2007, p. 296 and p. 538, note 54. T. Bezzola, Picasso: His First Museum Exhibition 1932, exh. cat., Kunsthaus Zürich, 2010, p. 236 (illustrated in color; illustrated again in situ in the 1932 Kunsthaus Zürich exhibition, p. 22). Paris, Galerie Paul Rosenberg, Exposition d'oeuvres récentes de Picasso, June-July 1926, p. 7, no. 47. New York University, Gallatin's Gallery of Living Art, December 1927. Paris, Galeries Georges Petit, Picasso, June-July 1932, p. 54, no. 161 (titled Verre et compotier). Kunsthaus Zürich, Pablo Picasso, September-October 1932, no. 157. Hartford, Wadsworth Atheneum, Pablo Picasso, February-March 1934, no. 56. New York, The Museum of Modern Art, Picasso: Forty Years of His Art, November 1939-January 1940, p. 123, no. 189 (illustrated). The Philadelphia Museum of Art, Picasso-Braque, May-November 1945, no. 5148 (titled Le Filet). Washington, D.C., Phillips Memorial Gallery, Picasso, February-March 1944 (illustrated on the cover). Paris, Orangerie des Tuileries, La nature morte de l'antiquité à nos jours, April-June 1952, p. 146, no. 122 (illustrated, pl. XLVII; titled Le Filet). London, Tate Gallery, Picasso, July-September 1960, p. 40, no. 111 (illustrated, pl. 25b; titled The Fish Net). New York, Paul Rosenberg & Co., Picasso: An American Tribute, The Twenties, April-May 1962, no. 45 (illustrated; titled The Net). New York, Acquavella Galleries, Inc., Picasso: A Loan Exhibition for the Benefit of Cancer Care, Inc., The National Cancer Foundation, April-May 1975 (illustrated; with inverted dimensions). Cologne, Josef-Haubrich-Kunsthalle, Wahre Wunder: Sammler & Sammlungen im Rheinland, November 2000-February 2001, pp. 152 and 303, no. G74 (illustrated in color, p. 153). Lugano, Museo d'Arte Moderna, Passioni d'arte da Picasso a Warhol: Capolavori del collezionismo in Ticino, September-December 2002, pp. 192 and 325 (illustrated in color, p. 193; titled Nature morte). "A fruit dish brimming over with grapes, a glass tumbler, and a solitary fig on a table beautifully incised with a gauzy veil of fishing net. This work reveals what a seductive painter Picasso could be when he wanted to, without recourse to decorative, Matissean trappings." So John Richardson extolled Nature morte au filet de pêche in his definitive biography of Picasso, in the culminating paragraph of the chapter devoted to the "triumphant summer" of 1925 (op. cit., pp. 289 and 296). 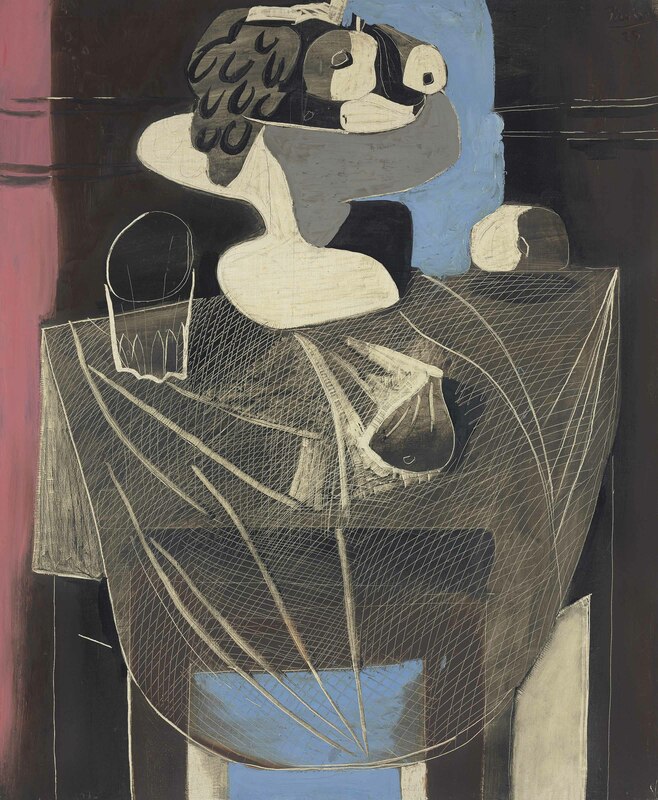 "When the great paintings of this summer were exhibited at Paul Rosenberg's gallery the following year, Picasso was seen to have taken still-life to previously unclimbed heights and unfathomed profundities. So gorgeous and, one would imagine, so instantly saleable was Still-Life with Fishing Net that Rosenberg decided to keep it for himself" (ibid., p. 296). Picasso, Olga, and their four-year-old son Paulo spent the summer of 1925--from the 10th of June through the end of September--at the fashionable Mediterranean resort of Juan-les-Pins, in a large rented house called the Villa Belle Rose. It was a moment of profound reorientation in both Picasso's personal and professional life. His relationship with Olga had deteriorated beyond repair, and he was already on the prowl for his next mistress. He had recently begun to distance himself from the core of people who had supported his post-war neoclassicism, most notably Jean Cocteau, and to ally himself instead with André Breton and the burgeoning surrealist circle (though he refused the poet's entreaties to sign the Surrealist manifesto, ever mindful of his artistic independence). Just before he departed for Juan-les-Pins, Picasso finished the violent and convulsive La Danse (Zervos, vol. 5, no. 426; Tate Gallery, London), which Breton quickly appropriated as a surrealist icon, dispatching Man Ray to photograph the canvas in Picasso's studio for the upcoming issue of La Révolution surréaliste. Having seemingly exorcized his fears and aggressions in that great canvas, Picasso delved back into the celebrated series of monumental, magnificently colored still-lifes--loosely cubist in their pictorial idiom--that he had begun the previous year. "Picasso had resumed an exploration of space which meant a reconnection with his most audacious cubist work of 1913-1914," Pierre Daix has explained. "And that inclined him toward still-lifes: large paintings built on contrast between fluid forms and geometry, with highly refined transparencies and provocatively unexpected conjunctions of objects on a table... This series reached its climax during the summer of 1925" (Picasso: Life and Art, New York, 1993, p. 188). While Olga and Paulo spent their days at Juan-les-Pins enjoying alfresco beach life with Sara Murphy and her three children, Picasso was too engrossed in his pictorial explorations to waste much time socializing, in stark contrast with previous summers on the Midi. "The razzmatazz of life at the [Murphys'] Villa America amused Picasso--up to a point," Richardson has written. "When his work was going full blast, as it was this summer, he became fiercely self-absorbed" (op. cit., p. 288). Whereas most of Picasso's still-lifes from the early 1920s had belonged to short series involving subtle formal variations on a strictly limited theme, the canvases that he painted during this heroic summer at Juan-les-Pins each make a distinct and individual statement. They constitute "one masterpiece after another," Richardson has proclaimed (ibid., p. 292). The musical instruments and fruit compotes of years past now cede center stage to a whole new and unexpected dramatis personae of still-life objects: plaster limbs, a carpenter's square, and a miniature toy theater in one composition; a statue bust, a caged bird, and a meandering vine in another; a splendid ram's head lying amidst a profusion of spiky fish and crustaceans in a third (Zervos, vol. 5, nos. 443, 445, and 456; figs. 1-2). Picasso would later explain, "I want to draw the mind in a direction it's not used to and wake it up. I want to help the viewer discover something he wouldn't have discovered without me" (quoted in F. Gilot, Life with Picasso, New York, 1964, p. 60). In the "magnificent" Nature morte au filet de pêche (to quote Josef Palau i Fabre), Picasso has placed a laden bowl of fruit and a beveled drinking glass on a simple, rectangular table; an apple and a fig have each tumbled from the compote onto the tabletop, which is draped with a delicate, gauzy fishing net. Despite the sensual attractions of the fruit, it is the fishing net that monopolizes the viewer's attention. Picasso has rendered the net by scoring the dark paint of the tabletop to expose the light priming underneath, creating a tactile web of fine scratches on the surface of the canvas. A few stronger, more forthright strokes suggest the folds in the net. Palau i Fabre has written, "During this period Picasso, above all in the still-lifes, had become accustomed to playing with the visual possibilities offered by linear scratches made either with the stem of his brush or with a spatula [figs. 3-4]. Here we witness the apex of this discovery. The scratches that cover part of the canvas to depict the net are slightly closer together in the top left-hand corner than in the rest of the composition, but only slightly. It is the tenuous, blurred touches of white that suggest the degree of proximity of the threads from each other. What counts here is the science of the optical result and, by extension, the artist's ability to invent" (op. cit., pp. 452-453). Within the creative universe of the composition, the fishing net serves several distinct functions. Most obviously, it evokes the ambiance of the seashore, much as the shorthand signs for sea, sky, sand, and stars do in the three great, calligraphic still-lifes that Picasso had painted at Juan-les-Pins the previous summer (Zervos, vol. 5, nos. 220, 224, 228; figs. 5-6). The motif of the net (painted, rather than incised) had in fact made its first appearance in one of these 1924 compositions, set off against a tablecloth with a wavy pattern (fig. 5). The ubiquitous mandolin doubles in this case as a fish caught in the net, its sound-hole like the doomed creature's round, staring eye and its neck extending like a scale-covered tail. In the present composition, by contrast, these implications of life and death have been wholly expunged. The atmosphere is relaxed and languorous, and all that Picasso has caught in his fishing net now, wittily enough, are two wayward pieces of fruit, the traditional still-life motif par excellence. The fishing net in Nature morte au filet de pêche also establishes the play of contrasts--transparent and opaque, light and dark, open and closed--that constitutes the central formal drama of this sumptuously enriched, late cubist still-life. "Cubism depends fundamentally not upon the character of the shapes--straight edged or curved--but upon the combination of other factors such as the flattening of volumes and spaces, the overlapping, interpenetrating, and transparency of planes, simultaneity of points of view, disintegration and recombination, and, generally, independence of nature in color, form, space, and texture," Alfred Barr has explained (op. cit., p. 132). The fishing net appears filmy and translucent where it covers the table, completely sheer where it hangs down in front, and nearly opaque where it doubles over on itself. Like the net, the clear glass tumbler is described exclusively with line, spare and delicate at the rim, thicker and more substantial near the base. The compote and the fruit, in contrast, are rendered in opaque, curvilinear planes of cream, gray, and black, as if the light and shade playing across their surface had coalesced into solid matter. The perspectival lines of the table recede toward a window or French door, a compositional device that Picasso had explored repeatedly in his still-lifes since his sojourn at Saint-Raphaël in the summer of 1919 (figs. 4 and 6). "The theme of the window itself belongs to a long tradition of pictorial theory--painting as metaphor for window, window as metaphor for painting," Brigitte Léal has explained. "Window frame echoes painting frame; reflective glazing in either case allows interaction of images inside and out; while curtains suggest a theater stage, and so on" (Picasso & Things, exh. cat., Cleveland Museum of Art, 1992, p. 32). In Nature morte au filet de pêche, however, the window no longer functions as a transparent pane, framing a view into depth. Rather, it has become a solid object in its own right--a slice of vivid blue, the color of sea or sky, but as flat and utterly impenetrable as the wainscoted wall that flanks it to either side. Nature morte au filet de pêche was featured in a landmark exhibition of Picasso's work that Paul Rosenberg mounted at his newly renovated gallery in Paris during the summer of 1926. Picasso himself attached enormous importance to the exhibition and made a point of visiting the gallery every day. The show consisted of fifty-eight oils, all but three of which dated to the previous three years. The majority of the paintings were still-lifes, and the dominant style was the luxurious, expansive form of cubism that Picasso had perfected in the post-war period. The artist's neoclassicism of the early 1920s was nowhere in evidence, and his newest surrealist departures received only scant acknowledgement. "Picasso wanted his choice of some fifty-eight paintings, mostly large, for Rosenberg's 1926 exhibition to establish that he had renounced neoclassicism but not surrendered to surrealism," John Richardson has written (op. cit., p. 308). The message to contemporary audiences was that Picasso had always been a cubist, and that he continued to take the style--ever vigorous--to new heights. The Rosenberg show aroused great attention and received widespread acclaim. Filling the ample gallery space, the large selection of canvases demonstrated Picasso's fertility as nothing had since his first exhibition at Rosenberg's in 1919. The paintings on exhibit from 1923 were mainly quite small, suggesting essays in preparation for more substantial works. Much larger canvases began to appear in 1924 and dominated his production the following year; at the Rosenberg exhibition, they lined the walls of the gallery's spacious central salon to magisterial effect. "These monumental still-lifes display a cubism of such maturity and confidence that it subsumed apparently contradictory styles without diminishing its visual authority," Michael FitzGerald has written. "The extremely flexible framework of Picasso's vigorous new cubism enabled him to achieve an integration of styles and exploration of formal metamorphoses hitherto impossible. For Picasso and Rosenberg, who kept several of the pictures [including Nature morte au filet de pêche] to hang in his dining room, these paintings demonstrated a masterful resolution of the issues that had roiled Picasso's art over the course of the previous ten years" (Making Modernism: Picasso and the Creation of the Market for Twentieth-Century Art, Berkeley, 1995, p. 161).